We are one of the renowned manufacturers and suppliers of a comprehensive assortment of Jet Mills, fabricated from finest quality of raw material. Each product is quality tested under a strict vigilance of our expertise team of qualified and experienced engineers. Our range of Jet Mill includes Jet Mill with Reverse Pulse jet, Jet Mill Table Top Lab Model, Jet Mill 2 Lab Model, Jet Mill, and Jet Mill 8 with Bag Shaking. We are indulging in the manufacturing in highly innovative industrial products, which includes Jet Mill. The product finds its usage in manufacturing industries such as ceramic glasses, herbicides and pesticides, drugs and pharmaceuticals, feldspar and other industries. The product is well-known for is functionality, fine finish and flawless results. Jet Mills are widely used in the manufacture of drugs and pharmaceuticals, organic and inorganic pigments, optical brighteners, fluorescent pigments, food colour synthetic dyes, metal (except malleable metals) carbides borides, herbicides and pesticides, ceramic glasses, alumina, feldspar, frit, kaolin, mullite, electronic grade materials such as materials required for semiconductors, phosphors, photoelectronic, high temperature critical materials, rocket solid fuels etc. 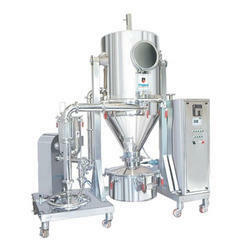 It operates successfully for products which must be ground & well dispersed. 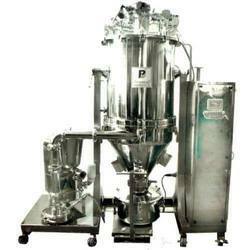 It disintegrates particles faster & uniform swiveling without forming agglomerates & homogenizes products in one pass. The Mill develops not only hydraulic high pressure in the grinding tool section, but turbulence & cavitations which when combined provide both a gentle grinding & the required impact, squeezing, cutting etc. This effects the homogenizing of products & wetting out of powders, all in one pass. The centrifugal force of the rotor brings the material inside the mill. The rotor & stator combination with its exceptional large surface area provides both a gentle grinding & the required impact effect. A three way valve at the discharge connection of the Colloid Mill can either provide material to inlet opening for rework or discharge the processed material. 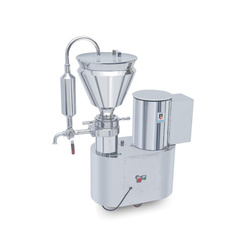 We offer an extensive range of Jet Mill 2 Lab Model, finds its usage in manufacturing organic and inorganic pigments, ﬂuorescent pigments, pharmaceuticals, ceramic glasses and many more. The product range is highly appreciated for its various features like sturdy design, flawless functionality, durability, reliability, and fine finish among the customers. Jet Mills are widely used in the manufacture of drugs and pharmaceuticals, organic and inorganic pigments, optical brighteners, ﬂuorescent pigments, food colour synthetic dyes, metal (except malleable metals) carbides & borides, herbicides and pesticides, ceramic glasses, alumina, feldspar, frit, kaolin, mullite, electronic grade materials such as materials required for semiconductors, phosphors, photoelectronic, high temperature critical materials, rocket solid fuels etc. Jet Milling is a concept of feeding of the powder particles into a flat circular milling chamber and subjecting the same tangentially with pressurized air or nitrogen through a venturi. The powder inside the milling chamber by the number of angular holes in a ring and placed around the periphery of the chamber. The heat sensitive and low melting point materials are easily micronized. The micronization takes place due to the collision between the incoming particles and the particles, which are already, accelerated into the spiral path. The larger particles of the product get retained at the periphery of the chamber by centrifugal force and the smaller particles exit with the exhaust air from the central portion of the chamber. Being one of the leading manufacturers and exporters of Jet Mill With Reverse Pulse Jet, we offer an extensive range of finest quality of Jet Mill with Reverse Pulse Jet. The product is widely used in the manufacturing of Drugs, Herbicides and Pesticides, Alumina and many others. Our team of experienced engineers specially designs the product in line with international quality standards. We are the renowned manufacturer of a comprehensive range of Jet Mill Table Top Lab Model, fabricated from finest quality of raw materials using advanced technology. Our expert team of engineers is involved in the continuous innovation and development of the product in synchronization with R&D departments. We ensure highly engineered and superior quality of products at competitive prices. Applications Jet Mills are widely used in the manufacture of drugs and pharmaceuticals, organic and inorganic pigments, optical brighteners, ﬂuorescent pigments, food colour synthetic dyes, metal (except malleable metals) carbides & borides, herbicides and pesticides, ceramic glasses, alumina, feldspar, frit, kaolin, mullite, electronic grade materials such as materials required for semiconductors, phosphors, photoelectronic, high temperature critical materials, rocket solid fuels etc. Working Principle Jet Milling is a concept of feeding of the powder particles into a flat circular milling chamber and subjecting the same tangentially with pressurized air or nitrogen through a venturi. The powder inside the milling chamber by the number of angular holes in a ring and placed around the periphery of the chamber. The heat sensitive and low melting point materials are easily micronized. The micronization takes place due to the collision between the incoming particles and the particles, which are already, accelerated into the spiral path. The larger particles of the product get retained at the periphery of the chamber by centrifugal force and the smaller particles exit with the exhaust air from the central portion of the chamber. Looking for Jet Mill ?